Ever thought like drifting your living room on ice? Well here you have it. 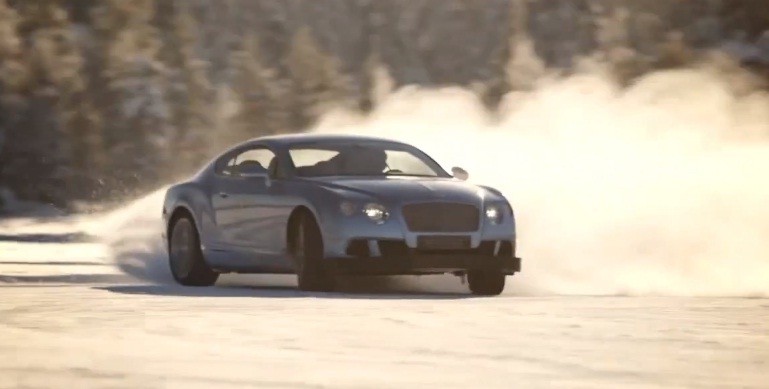 Presenting the luxuriousness and massive Bentley continental GT going sideways. Under the bonnet, a 6.0 twin turbo W12 engine delivering 567hp and 516 lb-ft of torque. This massive amount of torque is transmitted to the all-wheel drive system via an upgraded six-speed Quickshift transmission that allows double down shifting (from 4th to 2nd gear for example). The exterior look still hasn’t changed, no face lifting no nothing. Regarding the interior, you know what to expect, the typical Bentley luxury. This two tons car is able to achieve the 0-100km in 4.6 seconds, exactly like the lightweight Alfa Romeo 4C that was previously reviewed on TheAdsGarage. Not at all my type of cars. I would never buy a car in that category. I find it too massive and too luxurious, the typical car of a 65 years old millionaire equipped with a white mustache and a cigar, that goes to the Golf court every Sunday. I would rather own a classic car like a GT500 or a Mercedes 300SL. that delivers 450 hp and 317.15 lb-ft of Torque going sideways and specially on the snow, believe me is not an easy task. Well maybe it is, if you have Quattro. This is a teaser of the actual Audi S4 2013 snow drifting video. Hope the videos is gonna be out soon! EXTREME, 258 KM/H ON ICE in Lapland by minus 20 degrees on the replica (scale one) of the legendary track of Le Castellet.